Twice a month, Barb volunteers with Delivered Meals, a hospital based program providing meals to elderly people living in their own homes. The program has proven to be equally beneficial to both Barb and the recipients of the Delivered Meals, as Barb has developed some great friendships with many people in her community. In May, Barb attended a lunch at the Community Health Service, an event held to thank volunteers for their commitment and support. During the lunch, Barb was awarded with a certificate for her service. 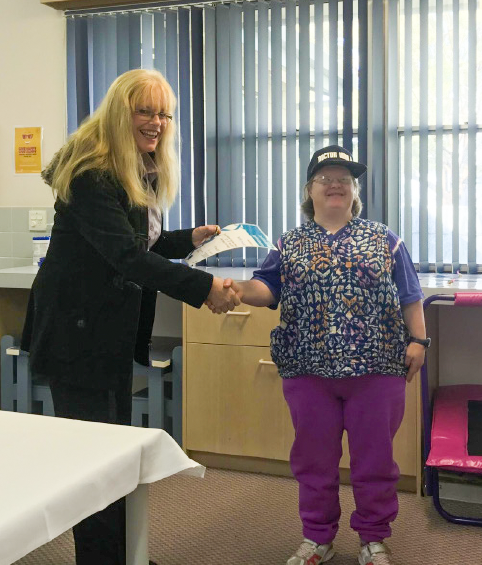 "At Community Living Australia we are passionate about providing meaningful opportunities for people with disability to engage with their communities," said Paula Roberts, Regional Manager for Kangaroo Island. 'Building supportive networks that create opportunities for clients such as Barb to live how they want to live and achieve their goals, whatever they may be, is a huge focus and we could not be prouder of Barb's commitment to her community and dedication to her volunteer work,' added Paula. This is a great story showing the ways in which people with disability can engage and give back to their community and it is great to see Barb getting some recognition for her great work.